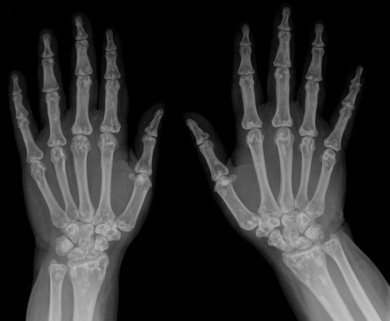 Osteopoikilosis, also known as ‘Spotted Bone Disease’ is benign autosomal dominant bone disorder that characterised by small areas (Islands) of sclerotic bony lesions. Osteopoikilosis mainly appears in long bones, carpal and tarsal bones, the pelvis, sacrum and scapulae. Radiologically differential diagnosis of osteopoikilosis includes mainly osteopathia striata, melorheostosis, tuberous sclerosis, sclerotic bone metastases and osteomas which may have similar clinical pictures but orthopedic treatment may be necessary for them. Islands of bone within bone. Human Genetics of Sclerosing Bone Disorders. ↑ 1.0 1.1 1.2 Hill CE, McKee L. Osteopoikilosis: An important incidental finding. Injury. 2015 Jul 1;46(7):1403-5. ↑ 2.0 2.1 2.2 Dasgupta R, Thomas N. Spotted bone disease. BMJ case reports. 2015 May 4;2015:bcr2014208422. ↑ Borman P, Özoran K, Aydoğ Ş, Coşkun S. Osteopoikilosis: report of a clinical case and review of the literature. Joint Bone Spine. 2002 Mar 31;69(2):230-3.